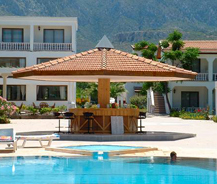 Hotel Club Z is located at the coastal town in Northern Cyprus. Club Z is one of most renowned holiday terminal in Kyrenia. It is surrounded by the distinctive Cypriot flora like walnut, olive and citrus trees. Club Z reflects the authentic and charismatic Mediterranean panache. Club Z extends a broad array of accommodative alternatives to choose like villas, cottages and rooms. All of them are fully furnished with legion of facilities which include exotic mini bar, air conditioner, showers, television set. A huge swimming pool in the hotel premises will help you getting break free from you busy and routine life. It serves the guests with captivating bar, established on the roof top, where you can relish your drink under the shade of Kyrenia Mountain Range. Club Z offers the services of exclusive spa and massage parlors to its guests. Shoppers can spend a quality of time discovering the traditional art and craft work in the near by town. The picturesque view of the hotel surroundings is breath taking. Once you depart from this place, you will miss the cordial reception and hospitality of the hotel staff. If you are looking for a scintillatingly animated holiday package, then Hotel Club Z is your depot.